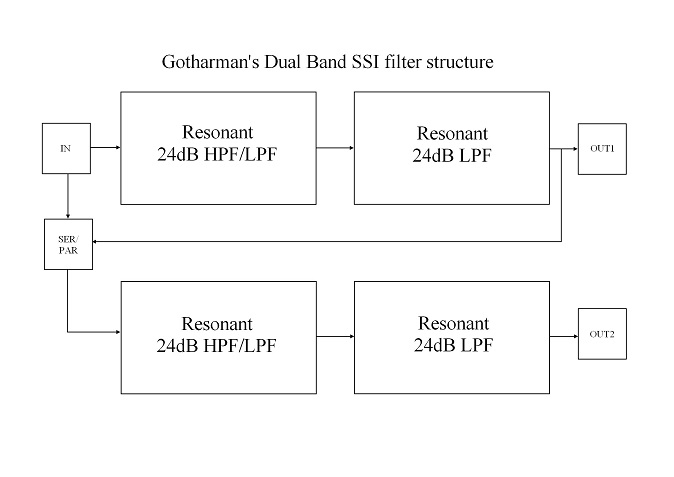 Dual Band SSI Filter. 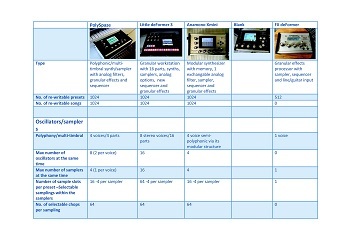 Four 24dB resonant filters, two that are switchable between HPF and LPF modes and two that are always in LPF mode. This gives four resonant peaks, and makes this filter ideal for formant sounds. It is also great for bass sounds and a lot of other sounds. 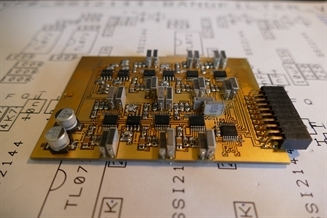 It is based on a bunch of the new great SSI2144 filter chip. This is the same filter, as the filters that are mounted on SPAZEboard2. It is organized as two chains of HPF/LPF + LPF in series. The two chains can be connected in parallel or serial to each other, and they output to each of their filter output. On Anamono X go to "More..>Common>Filter Settings", and set either filter 1 or 2 to: 8-Dual Band SSI, depending on in which filter slot you installed it. On Xmini go to "Edit>More...>VCF Type", and set the filter to: 8-Dual Band SSI. HpCut: HPF/LPF 1 and 2 filter cutoff frequency. Space between the 2 filters can be adjusted with Space. LpCut: LPF 1 and 2 filter cutoff frequency. Space between the 2 filters can be adjusted with Space. Reso: Filter resonance of all 4 filters. Space: Space between the cutoff frequencies of the two filter chains. HPF2: HPF2 filter mode HPF or LPF. HPF1: HPF1 filter mode HPF or LPF. Conn: Connection of the 2 filter chains. Ser (serial) or Par (parallel). 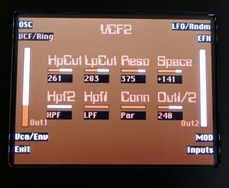 Out1/2: Mix between filter output 1 (HPF/LPF + LPF chain 1) and filter output 2 (HPF/LPF + LPF chain 2).